New railways stretching from Phnom Penh to Siem Reap, and to the Vietnamese border in the other direction, are to be built under new plans with backing from two Chinese companies. Improvements to Cambodia’s existing tracks will also be undertaken after China Railway 17 Bureau Group and Sino Great Wall International Engineering committed to assisting with the construction and funding of the projects. Kith Meng, chairman of local conglomerate Royal Group, signed a memorandum of understanding with the two firms during a visit to Beijing for a summit on China’s Belt and Road initiative, according to a copy of the agreement posted to the government-aligned Fresh News website. 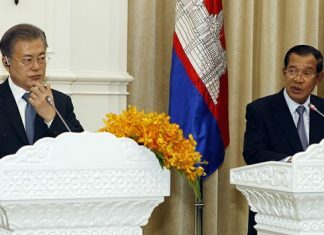 The three companies “agreed to cooperate in the construction and investment of the railways of Cambodia” and will continue discussing details of the developments, it says. Along with the new rail routes from Phnom Penh, a high-speed railway will be built to supplement the existing route from the capital to Sihanoukville, the agreement says. 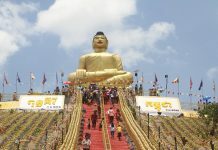 Renovations to the country’s two existing tracks would also be considered, including completion of a route between Phnom Penh and the Thai border, the document says. No details of the cost, timeline or role of each company are outlined in the agreement. John Guiry, CEO of Royal Railways, a subsidiary company of Royal Group, confirmed the signing on Tuesday, but said details were not yet ironed out. “There is a lot of work to be done,” he said. Cambodia is known for its high transportation costs, he said, leaving plenty of room for improvement in low-cost options like railways. “It’s always cheaper,” Mr. Guiry said, adding that he was “extremely excited” about the potential of the project. More details may be provided upon Mr. Meng’s return from China, he added. Chan Samleng, director of the Transport Ministry’s railways department, said he had not received word of the new agreement, but that studies of the potential railway projects had already been conducted by other companies. 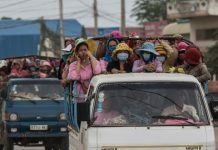 China is Cambodia’s largest foreign investor, with both the public and private sector pouring billions of dollars into infrastructure developments in the country. 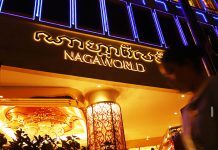 Cambodia’s ruling party has backed off of earlier threats it would request that the government of South Korea extradite members of the banned opposition Cambodia National Rescue Party (CNRP) as they gather in Gwangju this weekend in protest of Prime Minister Hun Sen’s regime.